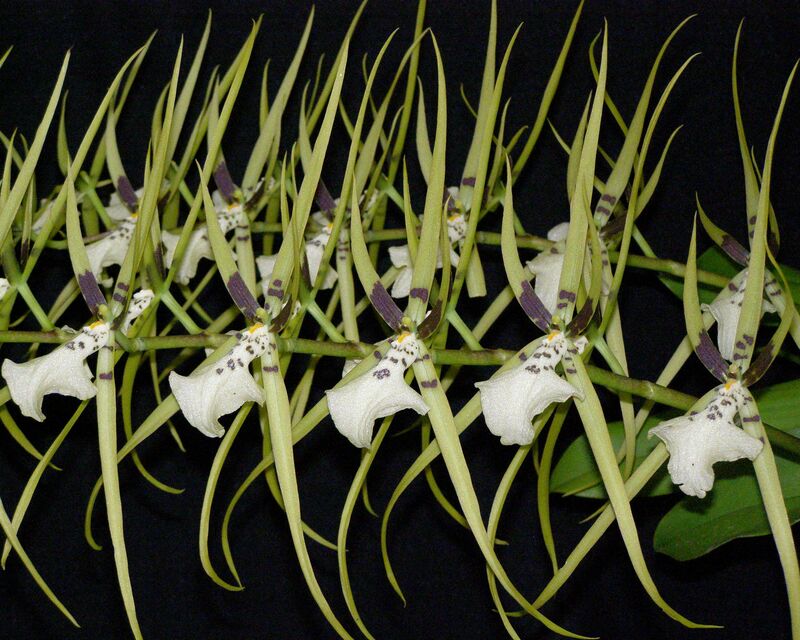 A spray of Brassia rex “spider” blooms await pollinating parasitic wasps. With a love like that, you know you should be glad, yeah, yeah, yeah. Granted, a little makeup can work wonders on date night. But the spider orchid, Brassia, takes things even further in order to attract an insect: it makes itself up to look like a pollinator’s favorite food. 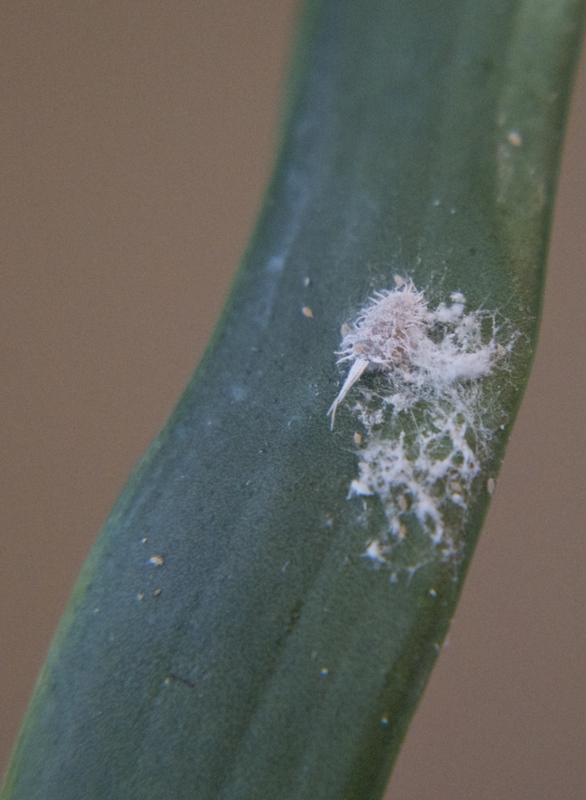 The orchid’s flower has developed the color and shape of a large tropical spider. But it’s not trying to attract the spider—no, that would be too obvious. 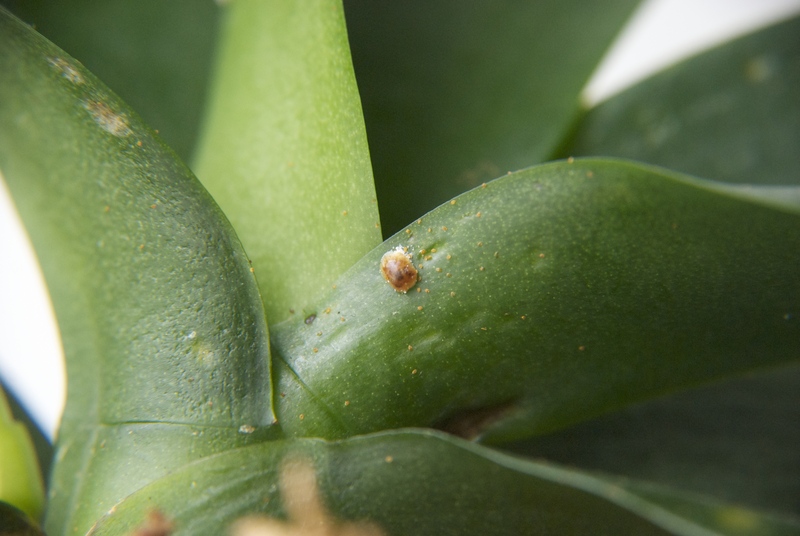 Rather, scientists think that the orchid attracts a wasp that hunts the spider as potential food for its own larvae. Thus the wasp is fooled into landing on the flower—and picking up its pollen—while hunting. So cheeky! A hammer orchid (Drakaea glyptodon) awaits its next suitor. Photo by Mark Brundrett. Falling, yes I am falling, and she keeps calling me back again. 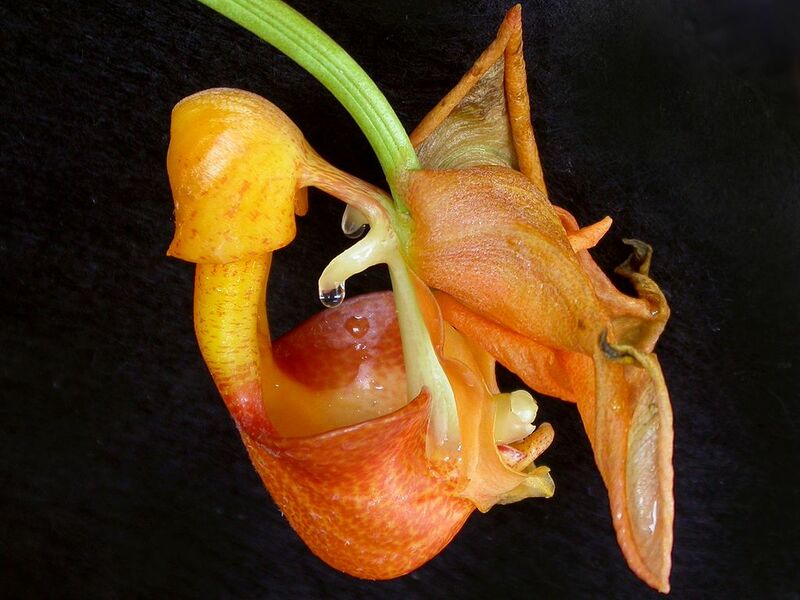 When the hammer orchid (Drakaea species) set its sights on the Thynnid wasp as a pollinator, it didn’t mess around: it developed a flower that looked like a lady wasp and a scent like the female pheromone used to attract a male. In nature, the lady wasp climbs to the top of a plant and awaits a male—who recognizes the pheromone, flies over, plucks her off the plant, and mates. 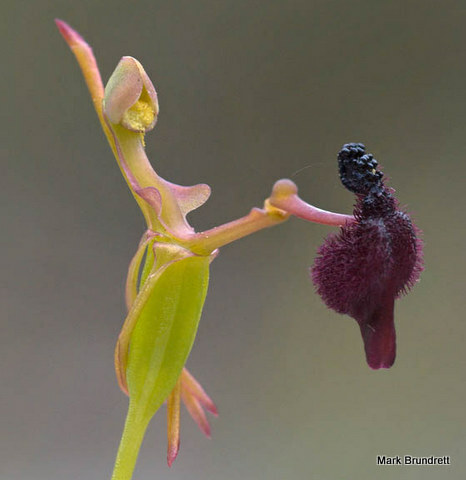 The hammer orchid’s flower mimics the look of the waiting female, but when the male flies up and lands, his weight throws him into the back part of the flower that carries the pollen—with the force of a hammer strike. He realizes he can’t carry her off, and heads off for another orchid, where the next hammer throw deposits the pollen he’s already carrying. Coryanthes speciosa by Dalton Holland Baptista [CC-BY-SA-3.0 ], via Wikimedia Commons. I will return, yes I will return. I’ll come back for the honey and you. The right perfume can change a man. 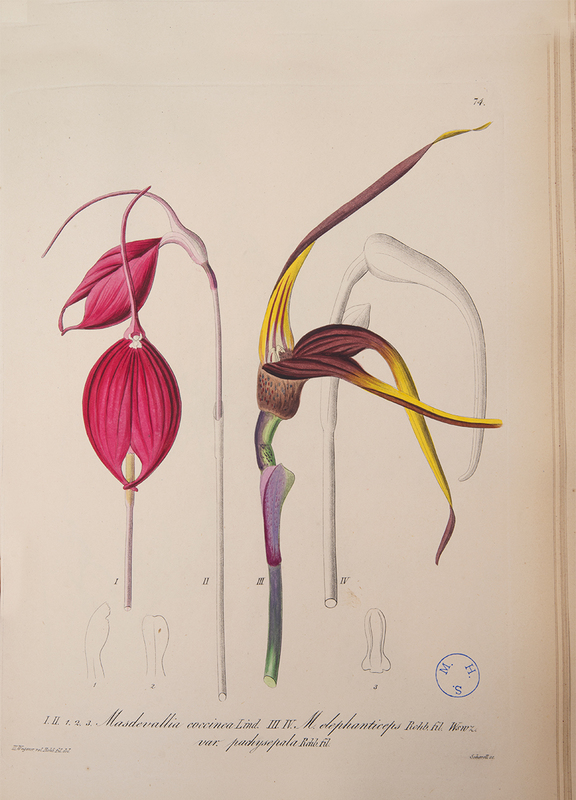 The bucket orchid, Coryanthes speciosa, has singled out the male euglossine bee for a pollinator. The flower produces a highly scented perfume that attracts swarms of male bees—which know that it’s a female’s favorite and rub it all over themselves. But step carefully, gentlemen: it’s a slippery slope into the flower’s bucket, where you’ll have to swim to the exit—picking up the flower’s pollen on your way out. On the plus side: you’ll smell great to that female bee when you finally find her! 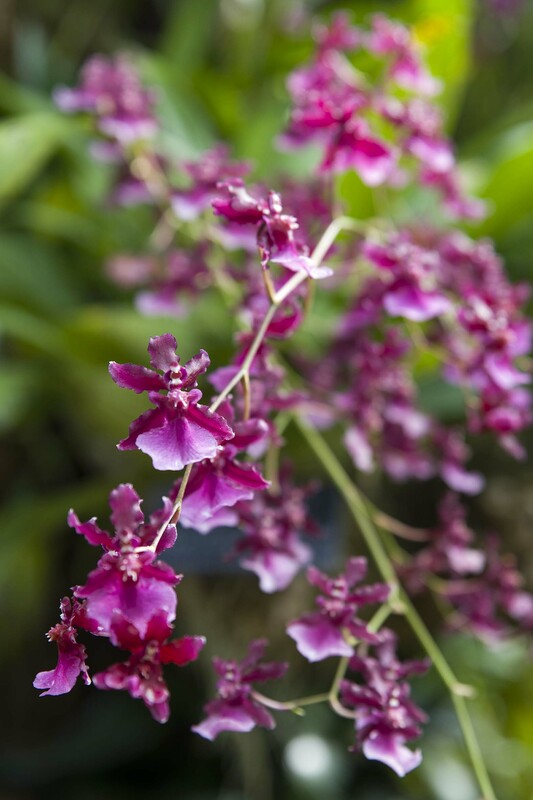 Oncidium Sharry Baby ‘Sweet Fragrance’ has dancing skirts and chocolate fragrance. Before this dance is through I think I’ll love you too. I’m so happy when you dance with me. The most fashion-conscious orchids (Oncidium) are called “Dancing Ladies,” because of their wonderfully ruffly petals that look like the spread skirts of dancers. 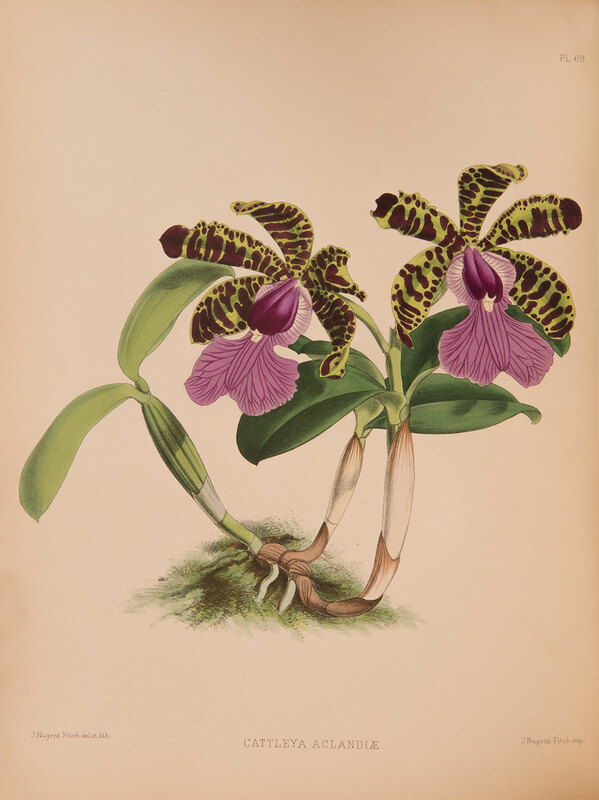 The most prominent petal on the orchid’s flower—called a lip, or labellum—can be ruffled, spotted, hairy, pouched, or fringed. All are features meant to attract a pollinator into using it for a miniature landing platform (the lip is much sturdier than this bloom’s delicate design lets on), drawing it in close to the center column that holds pollen. Oncidium Sharry Baby ‘Sweet Fragrance’ is the supermodel of dancing ladies—and did we mention that it just happens to smell like chocolate? Most fragrant in the late afternoon to early evening, this is truly an orchid that knows the way to a woman’s heart. 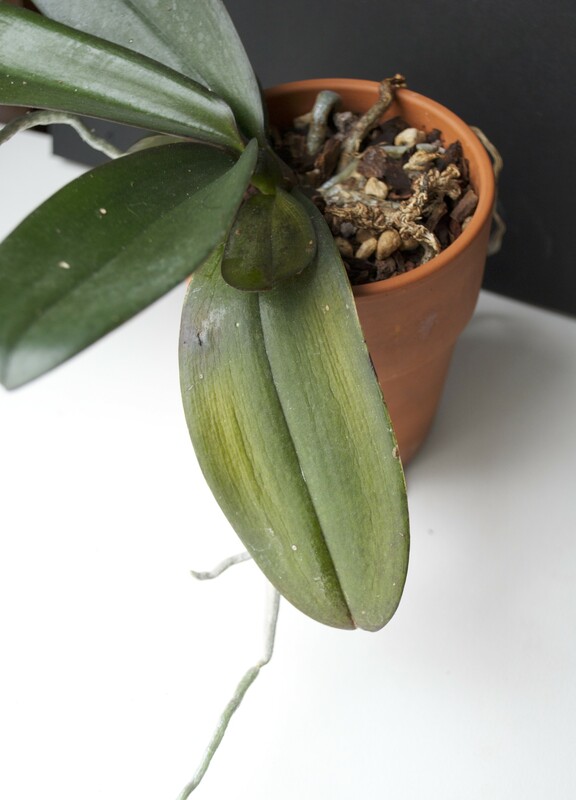 Angraecum sesquipedale ‘Flambouyant’ x var. bosseri ‘Lisa’—pollinated by the light of the moon. And the night you don’t come my way, Oh I pray and pray more each day, ’cause we love you, Mr. Moonlight. 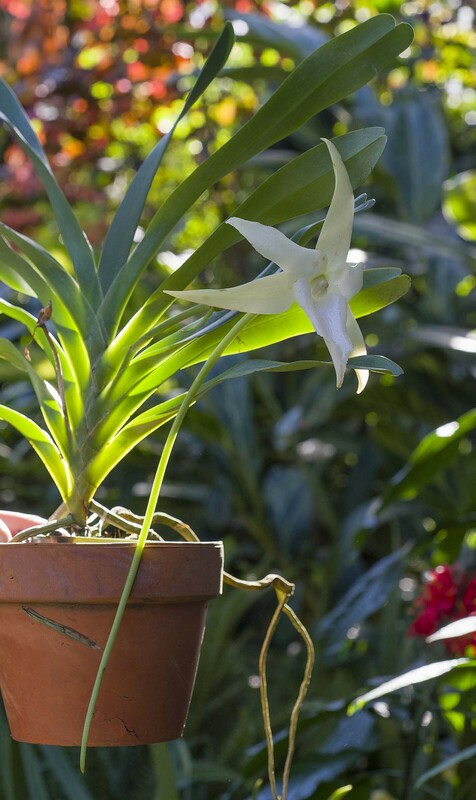 At the Orchid Show, which opens this weekend, you’ll get introduced to Darwin’s orchid, or Angraecum sesquipedale, an orchid with an elegantly long nectar spur. 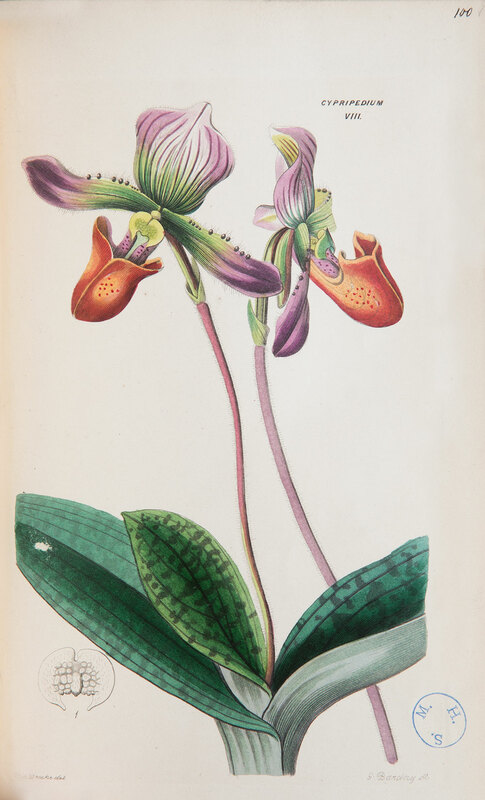 When Charles Darwin first described the orchid in 1862, he postulated that it must have a pollinator with a long tongue, though none was known at the time. The mystery persisted for 40 years until a hawkmoth with a fantastically long 12- to 18-inch proboscis—a straw-like tongue—was finally identified. The moth flits from flower to flower at night, reaching deep into the brilliant white flower’s spur in a split second—all by the light of the moon. With thanks and apologies to the Beatles, who performed for the first time in America on TV’s the Ed Sullivan Show 50 years ago this week. Since then, generations have grown up knowing the words to their love songs. In three days, the Chicago Botanic Garden will present its first ever Garden-designed Orchid Show (purchase tickets here). 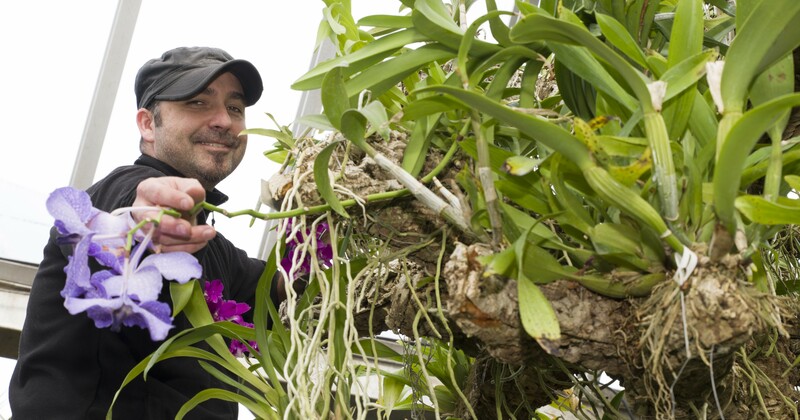 Horticulturist Gabe Hutchison attaches orchids to their new habitat: the orchid trees in the Tropical Greenhouse. Looking at it now, the winter of 2014 has not been an ideal year to tackle an in-depth and delicate project of this scale. A winter season with near record snowfall and record low temperatures has posed plenty of challenges in getting warmth-loving tropical orchids to the snowy, freezing Midwest, and securely into the Regenstein Center Greenhouses. Single-digit and sub-zero temperatures have been putting the Garden’s horticulture staff on heightened concern to protect these orchids in their various stages of buds and blooms. 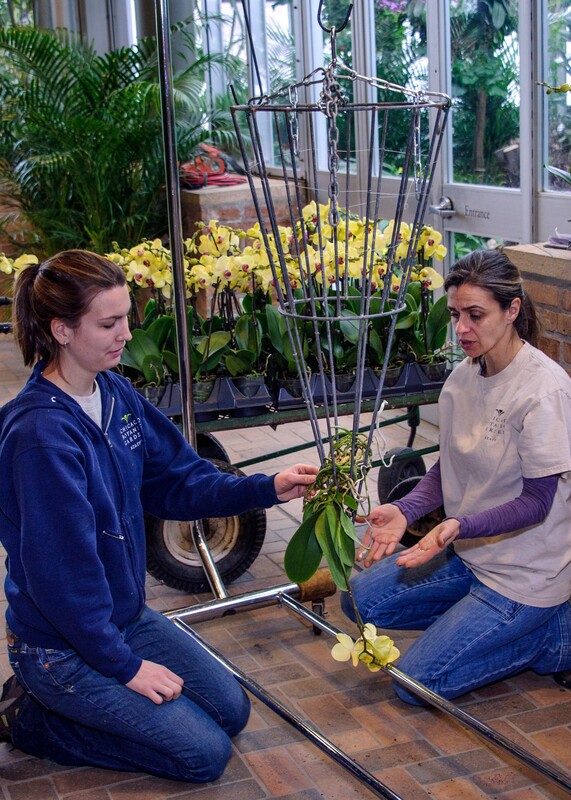 The transfer and well-being of more than 10,000 orchids has been a well-orchestrated undertaking shared by Garden staff (especially horticulturist Sharon Nejman) and the vendors who packed and sent the trucks. 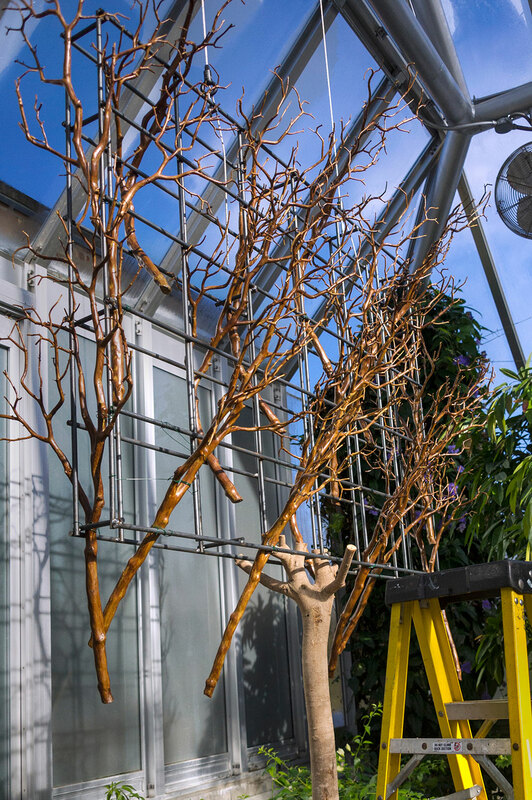 A combination of metal cage and hazelnut (Corylus) tree branches creates the perfect framing to place an orchid display. Beginning just a month ago, the Garden’s horticulture staff began a tear-down of Wonderland Express, immediately switching gears to the equally large endeavor of creating and setting up the Orchid Show. Existing Greenhouse beds have been modified to make room for impressive structures, and organic materials host epiphytic orchids of different genera. 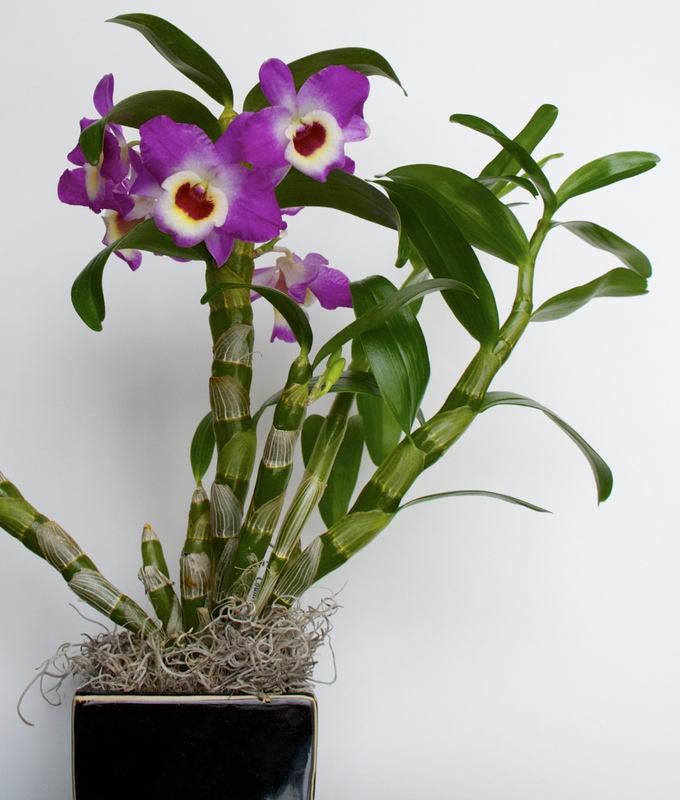 Presenting these impressive splashes of colorful orchids in a nontraditional display comes with some scalp-scratching challenges. More than 10,000 orchids find homes on a variety of structures designed and fabricated by Garden staff. 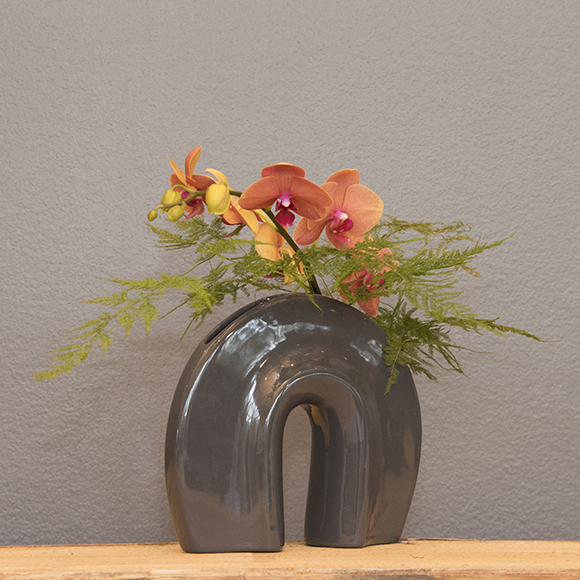 Working closely with Orchid Show designer and horticulturist Brian Barker, I had the shared task of designating orchid choices based on the length of bloom life and needed care, while trying not to limit creativity and whimsy. 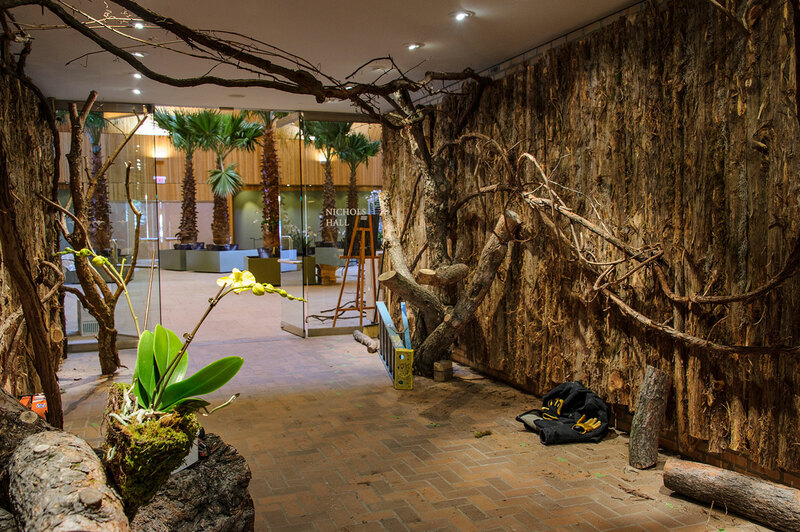 My experience in maintaining private orchid collections for individuals and overseeing the care and aesthetics of three preexisting cork bark orchid “trees” in the Regenstein Greenhouses opened a role in the planning and installation of the show for me. The entry to Nichols Hall transforms into an incredible tropical gateway. 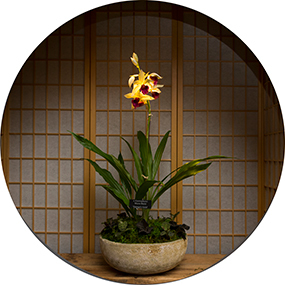 In June 2012, when first presented with the challenge of building a new exhibition—an orchid show—we discovered logistical riddles we hadn’t considered being thrown at us. 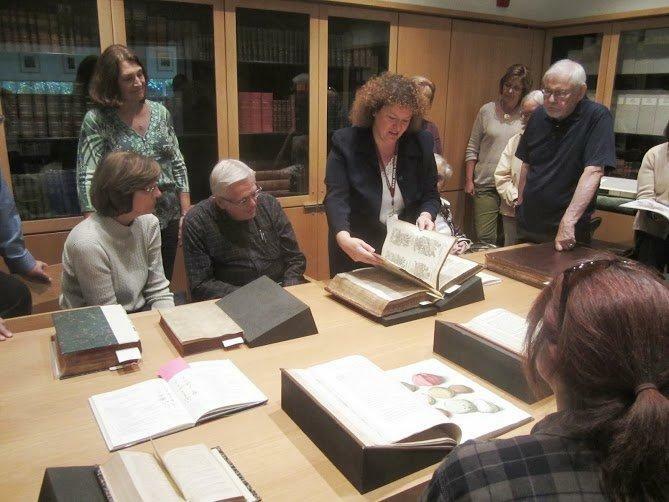 Along the way, new visions and ideas were presented, and have become focal points of the show during planning. Now we are here at the installation stage, with our materials, wondering,”How do I get hundreds of this particular orchid in these two or three colors to hang sideways or upside down over the visitors’ heads (sometimes way over), and keep the flowers happy?” Or, “How do we water a structure like this, and how do we do it efficiently?” Or, when we discover orchids are not happy in a location, how do we replace them quickly and in a way that doesn’t jeopardize the aesthetics of this visual centerpiece? Teamwork is critical! Leah Pilon and Aysa Pogue gently weave orchid roots into a display frame. Together, the horticulture staff is figuring out the solutions to these in-no-way-little challenges as they are presented, and in the process, admiring the great orchid creations that are coming together around us with pride. With every step, we are enjoying Brian Barker’s visions with the awe they deserve, knowing that in a few more days, we will be able to step back and appreciate our final creation and see it in the eyes of a Garden visitor. Winter white blankets the ground outside, but inside, the Greenhouses are alive with jewel tones. From the moment the public enters Nichols Hall, crossing through Joutras Gallery and the entrance into the Greenhouses, our goal is to present an experience of grandeur, a lush habitat of color, and a mix of curiosity and wonder.